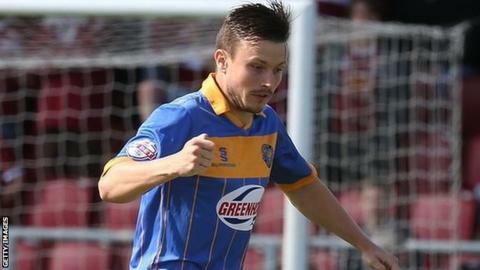 Andy Mangan scored two goals and made another as Shrewsbury Town climbed to third in League Two with victory over bottom-of-the-table Hartlepool United. An open and entertaining first half saw Liam Lawrence and Mark Ellis go close for the hosts, while Pools pair Michael Duckworth and Rakish Bingham were denied by goalkeeper Jayson Leutwiler. But Shrewsbury dominated after the break, Mangan firing in the opener. And, after teeing up James Collins for the second, Mangan headed number three. "The game lasts for 90 minutes. Sometimes, if it doesn't quite work out in the first 45, it can click into gear and produce the three points. "Hartlepool played well in the first half. But it was an easier second half. We tweaked a few things and started to find gaps and put players in there who would create good chances. "Andy Mangan is a terrific player. It has paid dividends him coming back to full fitness from a knee injury. He has two goals to show for his efforts." Match ends, Shrewsbury Town 3, Hartlepool United 0. Second Half ends, Shrewsbury Town 3, Hartlepool United 0. Attempt saved. Liam Lawrence (Shrewsbury Town) right footed shot from outside the box is saved in the top centre of the goal. Attempt missed. Bobby Grant (Shrewsbury Town) right footed shot from outside the box is close, but misses to the right. Foul by Dan Jones (Hartlepool United). Foul by Cameron Gayle (Shrewsbury Town). Attempt saved. Jean-Louis Akpa-Akpro (Shrewsbury Town) right footed shot from the centre of the box is saved in the top centre of the goal. Mickey Demetriou (Shrewsbury Town) wins a free kick in the attacking half. Corner, Hartlepool United. Conceded by Jayson Leutwiler. Attempt saved. Aaron Tshibola (Hartlepool United) right footed shot from outside the box is saved in the centre of the goal. Attempt saved. Jean-Louis Akpa-Akpro (Shrewsbury Town) right footed shot from the left side of the box is saved in the centre of the goal. Attempt saved. Jonathan Franks (Hartlepool United) right footed shot from outside the box is saved in the top centre of the goal. Attempt missed. Aaron Tshibola (Hartlepool United) right footed shot from outside the box is too high. Corner, Shrewsbury Town. Conceded by Jonathan Franks. Attempt missed. Connor Goldson (Shrewsbury Town) header from the centre of the box misses to the right. Substitution, Shrewsbury Town. Jean-Louis Akpa-Akpro replaces Andy Mangan. Substitution, Shrewsbury Town. Scott Vernon replaces James Collins. Corner, Shrewsbury Town. Conceded by Scott Flinders. Attempt saved. Connor Goldson (Shrewsbury Town) left footed shot from the left side of the box is saved in the bottom left corner. Attempt missed. Scott Fenwick (Hartlepool United) left footed shot from a difficult angle on the left misses to the right. Substitution, Hartlepool United. Scott Fenwick replaces Marlon Harewood. Goal! Shrewsbury Town 3, Hartlepool United 0. Andy Mangan (Shrewsbury Town) header from the centre of the box to the top right corner. Assisted by Bobby Grant. Corner, Shrewsbury Town. Conceded by Michael Duckworth. Attempt saved. Connor Goldson (Shrewsbury Town) header from the centre of the box is saved in the top right corner. Goal! Shrewsbury Town 2, Hartlepool United 0. James Collins (Shrewsbury Town) right footed shot from the centre of the box to the top right corner. Assisted by Andy Mangan. Corner, Shrewsbury Town. Conceded by Dan Jones. Attempt missed. Liam Lawrence (Shrewsbury Town) right footed shot from outside the box misses to the right. Neil Austin (Hartlepool United) is shown the yellow card. Attempt missed. Jack Compton (Hartlepool United) header from the centre of the box misses to the right.